Sometimes as I stuff a quilt through that tiny space under the arm of my sewing machine, I wish the quilt were smaller. "It's just a twin size quilt. Why should it be so difficult to work on?" Whether I crunch it, fan-fold it, or gather it up, even a twin size quilt is bulky to work with, and getting my machine quilting stitches even and straight is a frustrating task, at best. Yes, I have and use all of the machine quilting shortcuts and techniques to make the job easier - including using my super-duper gloves, spray basting the quilt so I don't have pins to work around, and installing my special cardboard box platform so the quilt is fully supported as it goes under the needle. But, I still get uneven stitches, quilting designs that only a mother could love (and you know that means they are really misshapen), occasional puckers and pleats on the back of the quilt, and - above all - frustration! Does anybody share my frustration? Re: There has to be a better way to quilt as I go! Derek, hard to help without knowing what fabrics you are working with...? i had the same problem, then i spent the big bucks on a touch screen Janome! this thing cant make a bad stitch unless you tell it to! Well worth the price of admission. Time to step your game up, if you wanna work on big pieces. BTW look at that loooong arm! Oops, sorry. I'm using all kinds. Mainly I have been using cotton. Lately I have been on a huge Amy Butler kick. I have been working with some of her "love" collection. 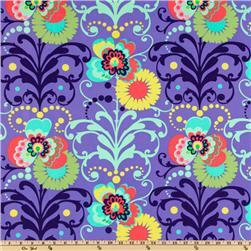 I especially love this love paradise periwinkle. design. thats a badass pattern, hard to make the lines match perfectly, but in the end itll be worth it. I too feel your pain Derek. Last week I was working with some particularly sassy 425 thread count velour and it had a mind of its own. I couldn't get straight stitches, had a hard time penetrating 2 layers of fabric even with my Kaiser T1000 Ni/Ti/Cd needle, and in certain light the fabric was giving me optical illusions. voila-my stitches were monocromatic laser straight, my T1000 was penetrating like a 500degF knife through 32degF butter, and the fabric was like putty in my hands. Fantastic advice! I had a similar lighting situation, but I have been drinking Merlot. I think the switch to PBR is exactly what's needed here. Derek, you need to listen to Chris on this. PBR is the way to go. I used to love quilting while drinking a few glasses of Zinfandel. The problem was, after a few glasses I'd always wind up taking my clothes off and cranking up the Culture Club CDs. A two hour sewing session would turn into a 6 hour Boy George tribute. Then there would be the dancing. You know what a Diva I am. Anyhow, I started going with a 12 pack of PBR and I've really been able to stay properly focused. Strangely enough I've developed a fascination for Hank Williams Jr music, but other than that it's worked for me.